Come and sample vegan mac 'n cheese from dozens of chefs from around the country and cast your vote for the best! The World Vegan Mac ‘n Cheese Championship started out in 2016 as the Vegan Mac ‘n Cheese Smackdown. Vegan chefs, caterers and mac ‘n cheese aficionados came together to compete for the Best Vegan Mac ‘n Cheese title, and lots of people came out to sample all that mac and cast their votes. The Vegan Mac ‘n Cheese Smackdown was such a huge success that lots of other vegan mac competitions started popping up all over the country, which inspired us to not only invite local chefs, but also participants from vegan mac ‘n cheese competitions from around the country to compete in the World Vegan Mac ‘n Cheese Championship. Our mac ‘n cheese competitions have brought out thousands of attendees (more than 1,000 attendees in 2016 and 2,500 attendees in 2017) and we expect 2018 to be no different, with an estimated turnout of 4000+ attendees. Attendees cast the deciding vote, so we encourage everyone who’d like to try a delicious, healthier version of their favorite comfort food to come out, sample lots of vegan mac and vote for their favorite! This year's competition kicks off Baltimore Vegan Restaurant Week. The mission of Baltimore Vegan Restaurant Week is to increase the awareness, benefits and accessibility of a plant-based diet through a fun, innovative and community-based experience across multiple neighborhoods. Visit mdveganeats.com to learn more. 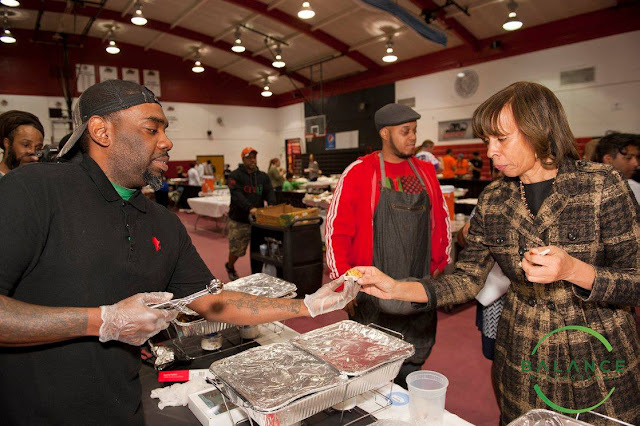 The World Vegan Mac ‘n Cheese Championship is an annual fundraiser, with proceeds going towards supporting the free classes, workshops, cooking demos and other health-centered programming offered at the Thrive Baltimore community resource center. For more information about Thrive Baltimore, visit www.thrivebaltimore.org.